Document analysis is a systematic, qualitative research method for thematically reviewing documents. The websites from six organisations were included. These organisations have previously been recognised as key stakeholders in sport safety in Australia, and hence are considered broadly representative of similar organisations. This research did not analyse the quality of the content of the resources, and while the importance thereof is recognised, it was outside the scope of this particular study. The field of sport injury prevention has seen a marked increase in information available through scientific and medical journals in recent years, as evidenced by a systematic review of over 12 000 published research articles.4 Coinciding with this, there has been a concomitant proliferation of lay safety information, such as policies, fact sheets and posters, on injury prevention strategies intended for informing the general sporting public, ostensibly based on the aforementioned scientific evidence. This has been accompanied by a strong trend towards electronic dissemination of such information,5 possibly because of the relative ease of access and cost-effectiveness of developing and disseminating resources in soft-copy rather than hard-copy form. In light of this, this paper presents a first step in collating, and categorising, sport safety resources that key organisations distribute electronically via their websites. The aim of this research was to determine the number, and thematically categorise the type and topic focus, of resources disseminated by a set of key organisations which curate sport safety promotion information intended for the general sporting public. Ethical approval was granted by the Federation University Australia Human Research Ethics Committee (Ballarat, Australia). Currently, in Australia, there is no single source of information or set of comprehensive resources available for sport safety promotion, or to inform the general sporting public about the risks associated with sport participation. Sport settings, therefore, need to actively seek and use a range of safety promotion information from a variety of sources, often found online. The websites of the NoGAPS organisations provide key example sources of this type of information. This study collected, catalogued and thematically categorised the types and topic focus of all safety promotion resources applicable to sport settings available from the websites of the NoGAPS organisations between April and October 2013, inclusive. First, the types of resources available from the NoGAPS organisations that could be included in a catalogue of safety promotion resources for community sport clubs—rather than elite sport settings—in Australia were determined. Starting with formal document types, the World Health Organization definition for policy (8 p4) was the starting point to identify relevant formal resource types: ‘A policy on…injury prevention is a document that sets out the main principles and defines goals, objectives, prioritized actions and coordination mechanisms, for preventing intentional and unintentional injuries and reducing their health consequences’. The words ‘action plan’, ‘strategy’ and ‘programme’ and their synonyms were added as also denoting types of resources.8–10 Second, the practical end versions of resources (such as posters/fact sheets/guidelines) and all synonymous derivatives were included. The option to add to this list of types of resources as they emerged was maintained throughout the data collection process. 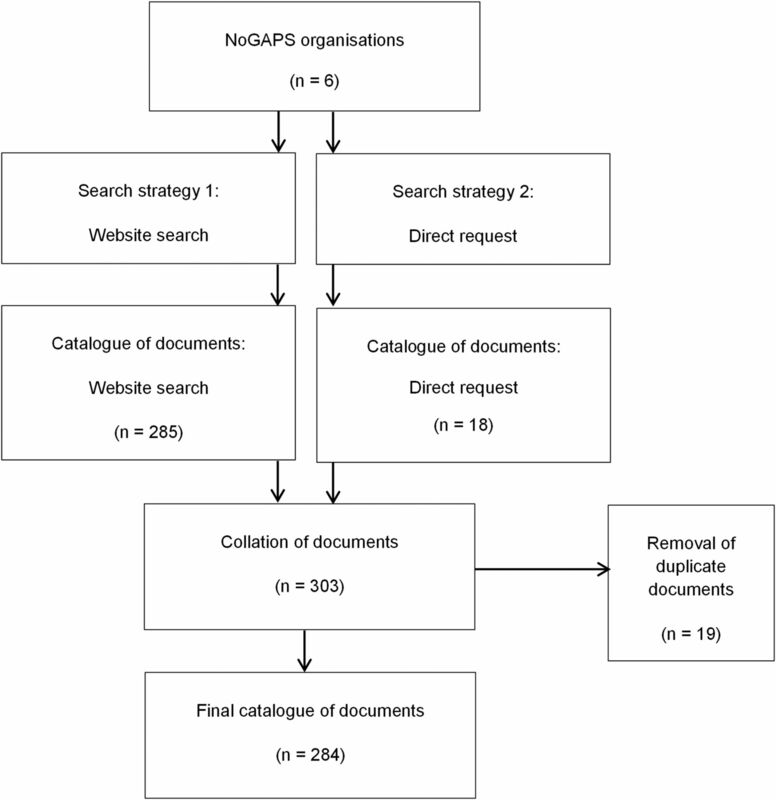 To ensure that no resources were missed, two approaches were used in collating resources for the catalogue: (1) an online search of each NoGAPS organisation website by the first author; and (2) a direct email request to each NoGAPS organisation representative. The website search was conducted first. The home page of each NoGAPS organisation website was accessed in April 2013. This page was scanned for links to safety promotion resources relevant to sport settings, before a systematic search of the full website was conducted. Owing to the continually evolving nature of websites as information is updated, this search was repeated 6 months later. Repeating the search ensured that the final catalogue represented an accurate reflection of the resources available from these organisations over the course of 6 months in 2013—so as to ensure inclusion of new resources that were added to the websites over that time period. Full details of the systematic search are detailed in online supplementary material 1. A direct request for the website resources was also made to each NoGAPS organisation's nominated representative, by email, in May 2013, requesting the same types of resources as sourced in the online search. This was to ensure that no resources were missed. Full details of this approach are detailed in online supplementary material 1. Two catalogues (one for each search strategy) of collected resources were created using NVivo qualitative data analysis software (QSR International Pty Ltd. V.10, 2012). Each search strategy catalogue contained a list of the resources identified and retrieved, organised by the NoGAPS organisation providing it. The two catalogues were then merged, duplicate resources between catalogues removed and a final catalogue of safety promotion resources available from the NoGAPS organisations was collated. This process is shown in figure 1. Search strategy used to identify the sport safety resources available from the NoGAPS organisations. NoGAPS: National Guidance for Australian Football Partnerships and Safety project. The topics of items included in the final catalogue were categorised for themes using document analysis, a systematic, qualitative research method for thematically reviewing documents.11 The catalogue was coded first by resource type starting with policy and its identified derivatives, second by the less formal document types and finally by including new types of resources as codes as they emerged. The second theme coded for was the sport safety issue/s addressed by the resource, based on resource title alone, and adding codes to the sport safety issue theme as they emerged. Each of these two themes (type and issue) was then depicted using NVivo-generated data visualisation Word Clouds that encode word frequency information via font size and font colour/shade,12 as shown in figures 2 and 3. Word Cloud of most common types of sport safety resources available from the NoGAPS organisations. NoGAPS: National Guidance for Australian Football Partnerships and Safety project. Word Cloud of most common sport safety issues, target groups and sports found in the sport safety resources available from the NoGAPS organisations. NoGAPS: National Guidance for Australian Football Partnerships and Safety project. A total of 284 safety promotion resources were included in the final catalogue, demonstrating a large number of individual resources available for sport settings in Australia from these NoGAPS organisations alone. The types of resources in the catalogue are shown in table 1 and figure 2. As can be seen in table 1, the NoGAPS organisations disseminated more practical forms of resources, such as fact sheets and flyers, than they did formal policies or regulations. Resources aimed at knowledge translation through education and guidance, such as research reports and guidelines, were the second and third most common types of documents disseminated by these organisations. Figure 2 clearly depicts the numerous types of resources (such as fact sheets), with the frequency of their appearance in the catalogue indicated by font size. The range of sport safety issues addressed by items within the catalogue is shown in table 2 and figure 3. Table 2 shows that resources for the prevention of physical injuries were the most frequent, which may be due to the focus of the sports injury prevention field being predominantly on biomechanical and musculoskeletal interventions. Resources for sport-specific injury prevention guidelines were the second most frequent issue addressed by the documents in this catalogue. This covered very popular sports such as running and cricket, but also included resources for less popular sports such as aerobics and in-line skating (rollerblading). Third, risk management and safety procedures, such as match day checklists, were well covered by all six organisations. In addition to injury prevention resources, four organisations also disseminated broader health promotion resources such as physical activity promotion for diabetes prevention. Figure 3 depicts the most common topic issues (such as concussion)—with frequency indicated by font size—as well as the target groups (such as women or children) and the sports they addressed (such as Australian football). Table 3 depicts the considerable duplication of resources for single sport safety issues across and within organisations. For example, there were 15 identified resources for concussion, including three duplicate documents, from two organisations. Similarly, there were 11 resources for heat/ultraviolet light protection from four different organisations, with three duplicate documents. This study is the first worldwide to analyse the number, type and topic focus of safety promotion resources available online for sport settings, across a set of key organisations. The resultant catalogue of resources addressing an overlapping array of issues is reflective of the rapid development and rise in the popularity of sport, and its associated safety problems, which has occurred without the concomitant development of comprehensive or targeted safety initiatives.13 Moreover, it creates and perpetuates the very same ‘too much information and too little time’ issue in information dissemination and availability as described in the introduction to this paper. Organisations such as those represented by the NoGAPS partners aim to bridge this gap by providing and disseminating safety promotion information in the form of a range of resources for a variety of sport settings, as evidenced by the catalogue in this study. The extent of this catalogue and the duplication within it, in turn, may be indicative of the current ad hoc process used in the development of sport safety resources. The development of new resources appears to be largely reactive to specific requests from sport clubs in reaction to specific incidents or media coverage, or resulting from outputs of research projects, rather than through targeted broad proactive prevention efforts. This development process perpetuates replication of the types of resources available across organisations, and duplication of resources covering the same safety issues within and across organisations. Duplication of resources addressing the same issue suggests a piecemeal approach and lack of strategic accumulation of existing safety knowledge and initiatives. Further, consideration for the needs of the sport setting itself remains underexplored, and it is imperative that the end-user perspective is taken into account if safety promotion is to be effective,21 as it is unknown as to whether or not these resources have been evaluated for effectiveness across different contexts. It is apparent from this study that people seeking sport safety information have to contend with the availability of a variety of overlapping resources, from different organisations, addressing the same sport injury prevention issue in either the same or different ways. An unintentional rivalry of resources for safety promotion activities is thus created, potentially rendering information dissemination efforts ineffective. Not surprisingly, considering the comparatively vast base of scientific literature, the prevention of physical injury in sport (eg, concussion or anterior cruciate ligament injuries) was most commonly addressed in resources from the NoGAPS organisations. The websites of the NoGAPS organisations also typically provided more of the practical and less prescriptive end versions of policies, such as fact sheets, than formal policies themselves. It was beyond the scope of this study to assess the quality of the content of resources or to explore how and why they were developed by the organisations. This should be the focus of future research because such factors are likely to influence the uptake and use of such resources by the public. Moreover, mere existence of online resources does not necessarily equate to evidence-based, useful or transferable information. A recent study of online concussion information found the quality to be varied with many key facts omitted from resources, even though the research knowledge base for safety practices to address concussion is sound.22 A more recent qualitative review of sports concussion educational information23 noted that simply making information available increases knowledge, but does not produce long-term behaviour change. Similarly, editorials and opinion pieces24–26 have stated that, despite the existence of scientific evidence, the effectiveness of sport injury prevention interventions remains decidedly ineffective because little attention has been given to information dissemination needs and processes. It must be stressed here that it is not interventions per se that work, but rather it is people that make interventions work.27 Interventions are always implemented within a wider socioecological context,28 and attitudes, individuals, institutions and societal constraints all play a role.29 Furthermore, resources are never embedded into contexts as a singular entity, rather they form part of a range of rival interventions/policies/resources,29 as this study has shown. The perpetual development and dissemination of evermore resources, without recognising the potential interplay thereof, or subsequent evaluation as to effectiveness within context, only adds to this rivalry. This study did not analyse the quality of the content of the resources, and, as discussed, while the importance thereof is recognised, it was outside the scope. The websites from only six organisations were included; however, these organisations have previously been recognised as key stakeholders in sport safety in Australia and hence are considered broadly representative of similar organisations.6 ,7 While this study was conducted using a set of Australian organisations, we believe the issues raised are indicative of the nature of the development of sport and its concomitant safety issues in similar countries globally. This study did not collect information on how the need for the particular resources was first identified or how the specific resources were developed by the organisations. It will be an important next research step to evaluate organisational process and intentions behind resource development and dissemination strategies. The first author completed the document analysis and thematic coding, with review input from the coauthor. Notwithstanding these limitations, and as described elsewhere,7 there was significant consultation with, and recognition of this research by, the NoGAPS organisations, each of which was invited to comment on the compiled catalogue and findings relevant to their organisation. This study used a qualitative document analysis approach to identify and describe how many and what types of resources are available for sport settings from the websites of key organisations, as well as the sport safety issues they address. The findings highlight important issues that are likely to influence the uptake of safety advice and information by the general sporting public. First, the general sporting public has access to at least 284 resources for safety promotion from these six organisations alone. Second, the proliferation of resources on apparently the same safety issues only adds to the rivalry of limited time and ability of end users to identify and implement safety initiatives within their sport settings. This is exacerbated by the fact that those accessing the resources and needing to make safety decisions are likely to be volunteers without formal sport injury prevention training or health backgrounds. If sport bodies do not mandate safety actions through higher levels of administration, there is potential for confusion at community sport club level as to what action to take when there are many possible options available to them though different resources. Third, the mere existence of a large amount of resources from reputable organisations does not mean that they are necessarily evidence based, fully up to date or even effective in supporting sport safety behaviour change. Over recent years, there has been a shift to online dissemination of sport safety promotion information,22 but much of this has not drawn on well-established principles of social marketing to direct it.30 ,31 Unfortunately, this ad hoc approach has led to a proliferation of resources that are neither regulated nor scrutinised for quality. Sport settings, therefore, have access to a proliferation of rival resources, which reflects a potentially inefficient and ineffective manner in which to promote safety. Research can only have an impact on sport safety practice if evidence is consolidated and presented in such a way that effective practices are triggered, rather than creating a rivalry for implementation efforts without concomitant evaluation for effectiveness. Rather than merely calling for more research, or for more knowledge translation, we conclude that there is an immediate need to undertake research to better understand how to focus information accumulation, resource consolidation and better evaluation of the effectiveness of sport safety resources. Most importantly, future development and dissemination of sport safety resources will require full consideration of the needs of the end user from the outset. The authors would like to thank the NoGAPS partnership organisation representatives for their assistance in the data collection phase, and their feedback on the findings of this research. The authors would also like to thank Dr PE White for earlier input to this research.
. The Social Life of Health Information 2011: Pew Internet & American Life Project. Washington DC; 2011. http://www.pewinternet.org/files/old-media/Files/Reports/2011/PIP_Social_Life_of_Health_Info.pdf (accessed 4 Dec 2015). Research Australia. Australia speaks! Research Australia opinion poll. Research Australia Limited, 2015. http://www.researchaustralia.org/advocacy-publications/public-opinion-polls (accessed 4 Dec 2015).
. Developing Policies to Prevent Injuries and Violence: Guidelines for Policy-Makers and Planners. 2006. http://www.who.int/violence_injury_prevention/publications/39919_oms_br_2.pdf (accessed 1 Apr 2015).
. Child safety and wellbeing in Australian sport. Safeguarding, child protection and abuse in sport: international perspectives in research, policy and practice. Routledge, 2014;116–24.
. The first aid policies and practices of community sports clubs in northern Sydney, Australia. Health Promot J Austr 2004;15:155–61.
. Evidence-based policy: a realist perspective. Sage, 2006.
. Realistic evaluation. Sage, 1997. Contributors SB led this work as part of her PhD studies—designed the study, led its conduct, had the major role in paper writing and is responsible for the overall content as guarantor. CFF contributed to the design of the study and the writing of the paper. Funding SB was supported by a Federation University Australia International Postgraduate Scholarship. This study is part of her PhD work, under the cosupervision of the coauthor. CFF was supported by a National Health and Medical Research Council (NHMRC) Principal Research Fellowship (ID 1058737). This study was partially funded by an NHMRC Partnership Project Grant (ID 565907) with additional support (cash and in kind) from the project partner agencies: the Australian Football League (AFL); Victorian Health Promotion Foundation (VicHealth); NSW Sporting Injuries Committee (NSWSIC); JLT Sport, a division of Jardine Lloyd Thompson Australia Pty Ltd, Sport and Recreation Victoria (SRV); and Sports Medicine Australia (SMA). The Australian Centre for Research into Injury in Sport and its Prevention (ACRISP) is one of the international research centres for the prevention of injury and protection of athlete health supported by the International Olympic Committee. Ethics approval Federation University Australia Human Research Ethics Committee.